Utilizing a mobile device app to control another device has become commonplace. Indeed, build a new home theater with the right equipment, and it’s fairly easy for an iPod to provide more funtionality controlling the equipment than a remote control. In the last couple of years, we have also seen networks and streaming services explore how to tap into mobile devices as supplementary second screens, extending the experience and encouraging viewership. Netflix sounds like they might be looking to mash these two ideas up by using the second screen to control the service across multiple devices. The basic idea would be to allow users to engage in their browsing and searching from their mobile device, a task for which the devices are generally better suited than the 10-foot interface apps deployed for Smart TVs and settop boxes, and also control playback on the television from the mobile device. The Smart TV or settop box would still be doing the heavy lifting of streaming, unlike a system such as AirPlay where the mobile device is pushing the content to another device, but it would instead bring all of the discovery and remote control functionality into one place on the user’s mobile device. Netflix is getting ready to let users control the playback on their TV with their mobile phones. 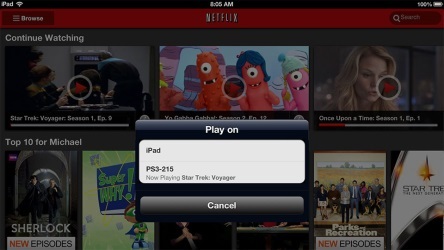 The company recently added support for such AirPlay-like features to the PS3, and is now looking to extend support to a number of other connected devices.